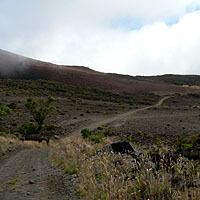 The road winds through ground cover and around cinder cones. Lots to do and see here, time to explore! Two roads go around Mauna Kea, the lower Mana Road goes from the 6,500 foot level and comes out in Waimea. 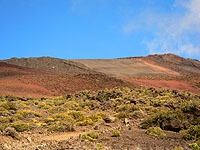 The higher Kahinahina Road starts at the 9,000 foot level and goes 37 miles, all the way around Mauna Kea and back out on Saddle road. The upper road is a diverse drive that ranges from 7,200 ft all the way to 10,000 ft. Since the tree line is at about 8,000 to 9,000 ft this drive takes you in and out of a variety of ecosystems interspersed with spectacular Mauna Kea vistas you can not see any other way. 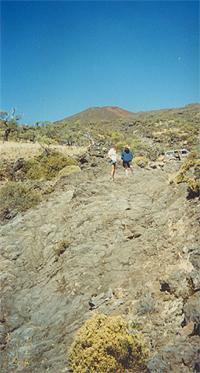 Several stops along this 7 hour excursion allow for short explorations and hikes. This is a 4-wheel required road - ESPECIALLY if you intend to do the entire tract. There is NO WAY you can make this road all the way through without 4-wheel drive. While early portions of this road can be done in any vehicle, you MUST have 4-wheel to complete this drive! Do not attempt this drive if it has been raining hard within the last 24 hours or looks like it will rain in the next 24 hour. This drive takes you over numerous river and flood channel gorges and flash floods could easily wash you off the road or cut you off in both directions! There are absolutely NO SERVICES on this road. Make sure you have a full tank of gas and plenty of food, water, and emergency supplies. A cell phone would be a very good idea in case of emergency. This drive goes between 7,200 ft and 10,000 ft. 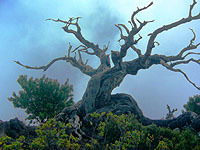 It is possible to experience altitude sickness which symptoms range from irrationality to nausea and even fainting. If taking any of our side hikes be sure to walk slowly and don't overexert yourself if you feel the effects of altitude sickness. Because of the altitude and the environment this area is usually very dry and exposed, be sure to have sun screen not only for when you get out of the car, but on your arms while driving. Wear sunglasses and drink plenty of water as it is very easy to become dehydrated. There are very many side roads along the way. While many of the side roads do lead to interesting sights we do not recommend straying from our described drive for a variety of reasons, including getting lost. Consider bringing a GPS unit as well, as we do have this mapped with waypoints. 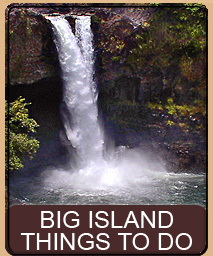 The start of this scenic drive can be reached in about the same amount of time regardless of whether you're on the Kona side or the Hilo side of the island. If you are on the Kona side or up in Waimea, take Highway 190 and turn onto Saddle Road. 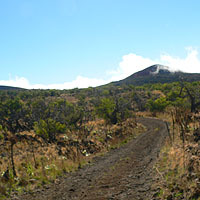 Follow Saddle Road to the 28-mile marker, the junction of Mauna Kea Access Road and Saddle Road. 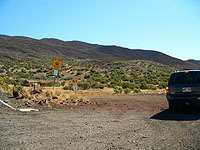 Make a left onto Mauna Kea Access Road and take it to the 6.4-mile marker on Mauna Kea Access Road and the Mauna Kea Visitors Center. 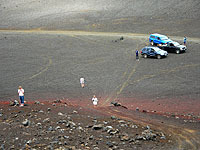 If you are on the Hilo side we recommend you follow the detailed instructions in our Scenic Drive To The Summit Of Mauna Kea, and read it up to just before the 6.4-mile marker point - at the Visitors Center. We do not recommend incorporating the summit of Mauna Kea into this drive as this is a long day-trip and it is best to start early, as you will end late. You may, however, wish to stop at the Visitors Center to stretch and use the restrooms before you begin. JUST BEFORE the 6.4-mile marker - and JUST BEFORE the Visitors Center is a guardrail on the right side of the road. Sitting just below the guardrail is an old unused top of a small observatory dome. JUST BEFORE the guardrail, and this dome, is a dirt road going off to the right. This is the start of Kahinahina Road. Instead of our normal odometer-by-odometer Scenic Drive presentation, we will do this more as a narrative because this is such a long drive. Well, actually, it is only 37 miles but it is slow going and the entire trip is going to take 7 hours. So the odometers will be going fast, with a couple stops for interesting views or quick side-hikes. The Hawaiian word hinahina (he-na-he-na) means silversword and the prefix ka means the so this would be The Silversword Road and as we will see, that is indeed the case. 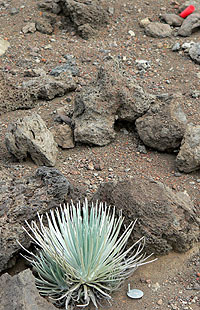 Silversword is, of course, a very rare and endangered plant that only grows on the Big Island and Maui. You can read more about Silversword here - but first back to our drive. On today's drive two other vehicle accompany us with friends joining us. 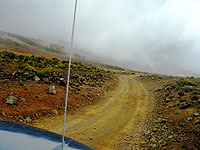 We always prefer the safety of numbers when we are doing some of the more remote and difficult scenic drives, such as this one and the similar drive to the summit of Mauna Loa. Surprisingly, however, it is not that uncommon to meet other vehicles on this drive, as hunters and off-roaders frequent this area. Indeed, we saw a number of parked trucks and met one truck about half way around. We should also mention that while you can, of course, do this drive either the way we are going, or backwards, we prefer going the counterclockwise way around. The main reason is that near the end is the roughest section and it seems to us that it would be worse coming the other way. While we have never taken this road the other way, we do know people who have and they make it through, so it must be doable through the really knarly sections. Ok, starting out we make the right hand turn off of the Mauna Kea Access Road, just below the abandoned observatory dome top and guard rail. This is a flat dirt road with very little markings but there should be a yellow sign reading R1. There are many roads up here that intersect, loop, dead-end, and some of which even extend down to Mana Road and below. Most of the main roads have been recently marked with bright yellow signs from R1 through R15. In cases where a road is not marked, it is either a loop and will come back to meet the main road, or it is a small off-side access or hunting road that will most likely eventually dead-end. For this trip we always want to stay on R1. At odometer 0.5 we encounter our first gate, which should be unlocked and open (first GPS Waypoint). 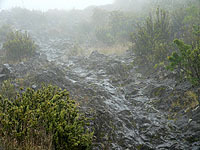 The road here is rough cinder and the sides vary from pahoehoe to a'a flows with Māmane bushes on either side. For the most part we are going through sparse vegetation here as we are at the tree line. 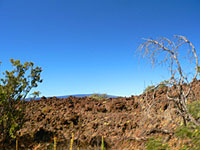 To our left virtually nothing grows as the upper slopes of Mauna Kea rear upwards. 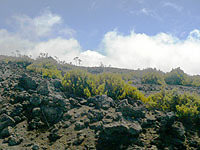 To our right is vegetation, which become more frequent as the slopes recede below us. At odometer 3.3 we get a steep incline and then at odometer 3.9 we stopped for a few minutes to take pictures (next Waypoint). All the way along this first 1/3 of the road, as you begin to bend around Mauna Kea, you still get spectacular views of Mauna Loa out your back window so you should stop from time to time to check out the view. The cinder cones to the left side of the road along this stretch are also pretty nice. Ranging from brilliant reds through dusky browns, these are views you don't normally see of the summit. Approaching the 4.1 odometer mark is another fork. In this case we went left but we believe it doesn't matter as the right fork loops around and meets back up. Immediately after, at odometer 4.2 is another for which we took the right (straight-through) path. At odometer 5.5 (and our next Waypoint) we find our first large planting of Silversword (hinahina or 'āhinahina). 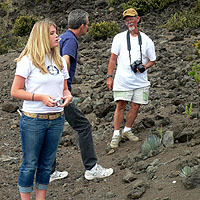 These plantings are one of many groupings in an attempt to bring back the endangered Silversword plants. 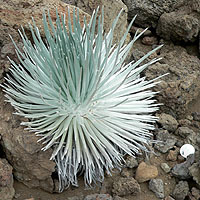 Prior to western contact Silversword plants flourished, but the introduction of sheep and other grazing animals quickly destroyed the population until only 50 plants remained on the Big Island. 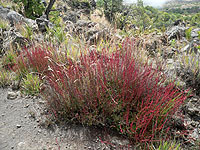 Since these plants only grow on Maui and the Big Island, they became endangered and these plantings are some of the attempts to bring back the population. Carefully walking about, you will notice there are literally hundreds of Silverswords planted here. 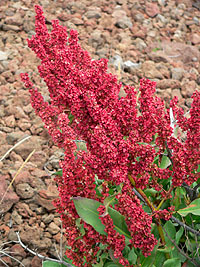 Each plant has a shiny identification tag and most of the plants are very healthy. 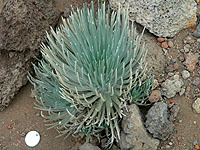 Silversword are rather strange in that they only bloom once, after growing for 40 to 50 years, and then immediately die - thus restoring these plants is difficult and tedious work. As we continue down the road we will see other Silversword plantings on both side of the road. At the 5.8 odometer mark we pass over a tributary with a nice valley view. This is the start of a number of gorges and streambeds that we will cross - all of which are small sources to the larger Wailuku river below. We continue passing stream bed after stream bed, mostly small runoffs, and we can see to the left gorges cut through the cinder cones. 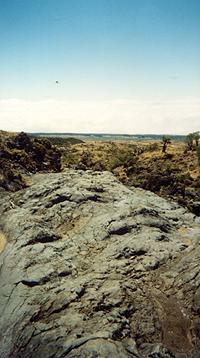 This is the primary source of water for the eastern side of the Big Island. During a heavy upslope rainfall these streambeds would be choked full of water and debris, not somewhere you would want to be. 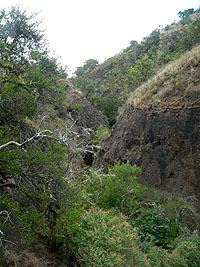 At odometer 7.0 (and the next Waypoint) we encounter probably the largest stream and the primary source of the Wailuku. This stream is a good twenty feet across and the rocks are all very smooth and bare having been scrubbed clean by thousands of years of cascading water and rocks. Normally dry during the summer months (if it isn't raining) it is amazing to think of all these streambeds combining together with other sources downslope to produce the huge Wailuku river. At 7.1 we encounter a fork, which you should take to the right. At 7.6 is a left turn onto R4. This turn, if you take it, continues about 1/8 of a mile to the end of R4. A short hike takes you to enclosures on both the left and right sides of the road where Silverswords are planted in the protected fencing. We continued past the R4 fork, staying on R1. At odometer 8.1 we encounter the R5 fork - keep to the left on R1, and at 10.0 we find the R6 fork, stay to the left and go up the big hill. At 10.9 you descend the hill and immediately climb back up another big hill. As we come up to 11.1 the vegetation is dwindling on all sides of the road and gives way to gigantic cinder cones and enormous fields of blocks. This is the start of quite an amazing area - where rocks were blasted high into the air from huge vents, cracking into these jumbled pieces when they hit the ground. 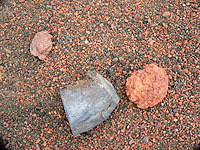 The ground here is littered with a very ordered casting of rocks from fist size to head size. 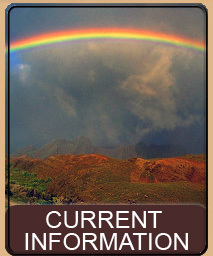 At 11.7 R6 rejoins us, stay on R1 and soon at 11.8 we reach Pu'u Kanakaleonui. This will be our longest stop on this Scenic Drive. 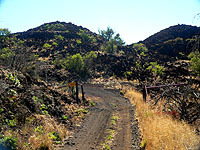 You should now be parked with Pu'u Kanakaleonui, the majestic cinder cone, on your right hand side. 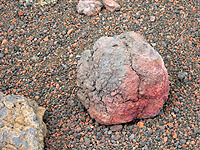 All around you is a huge field of very small pebbles and rocks, interspersed by fallen blocks and many, many round and football shaped Lava Bombs. 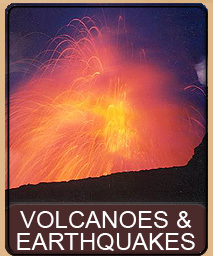 Lava Bombs are produced when molten lava is shot from a vent far into the air. 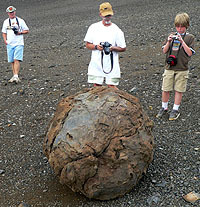 As it falls back to earth, the molten blob of lava spins turning it into a sphere (if it spins evenly) or a football shape (if it spins primarily on one axis). If these cool enough, but not too much, before hitting the ground they can stay intact and remain as balls, sitting exactly where they landed. 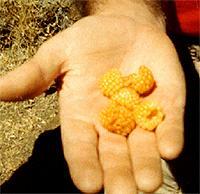 The ground around you here is littered with Lava Bombs, from fist sized on up. It is quite the sight to see. We like to take quite a long break here. There are a number of things to do and this is also a perfect spot for a picnic (though there is another spot further down the road which is also good, so if you want, make this a brief snack instead). If it is windy or cold, you will notice a not-too-steep road to your right that goes up into the lowest portion of the cone. You can easily drive up there and down into the cone where you can be more protected from the wind. 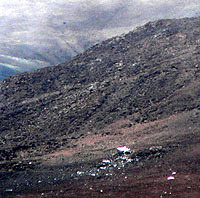 If you look upslope towards the summit of Mauna Kea from here, you will notice some white trash about 1/3 from the top of the ridge. This is the wreckage of an airplane that crashed here a number of years ago. 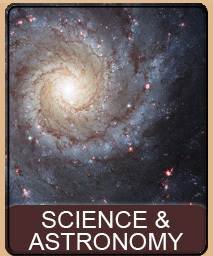 It is miles away so inaccessible for most practical purposes. 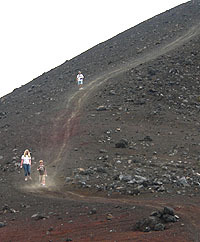 You will see a small trail going to the summit of Pu'u Kanakaleonui. 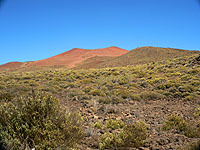 This is a fun and short hike, but do be careful as you are at altitude meaning it is harder to breath, and the trail is very steep with loose pebbles. Wear sneakers or boots and a hiking pole wouldn't hurt. 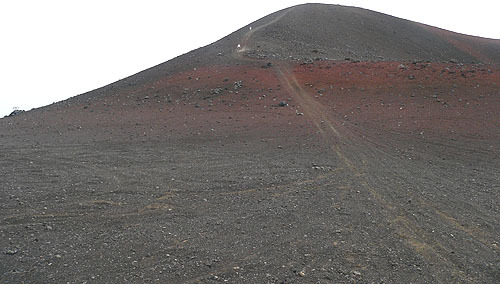 When you get to the top, besides catching your breath you will have an outstanding 360° view of the valley below you, the other side of Pu'u Kanakaleonui (which is a huge vent and blowout) and more nearby cones with trails leading to them. 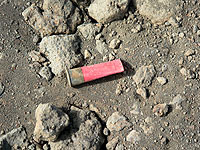 There is a geo-position marker here (USGS) and often an offering or two to the mountain deities. The lush forests you see below you, on the back side of Pu'u Kanakaleonui, are areas where experiments are currently going being done on reintroduction of rare and near-extinct Hawaiian birds, such as the Palila (Loxioides bailleui) - the endangered Hawaiian honeycreeper. 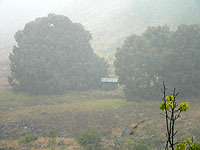 Captive-reared Palila have been released in this lower forest area in an attempt to repopulate the species. 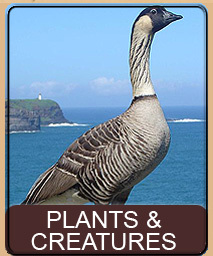 A total of 10 birds were released between 1996 and 2002 with known genetic diversity. Each bird was banded and also had an electronic transmitter that allowed tracking for 8 weeks. After our hike and snack we returned to the car and continued. 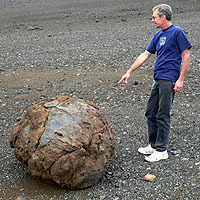 At 12.0 is a left fork and a huge Lava Bomb sitting alone in a field of small pebbles. Intrigued we make the left and parked next to the bomb. This bomb is a mystery. How did this bomb get here? 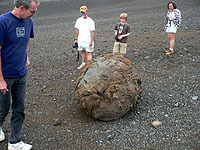 Unlike the cinder cone we were just at, this bomb sits alone for as far as the eye can see. 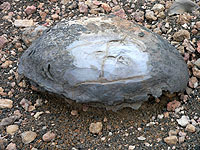 The largest other pieces of rock are an occasional foot sized chunk - with the majority of rock being small pebbles or cinder. This bomb is huge, and sits alone. Was it thrown here? As most bombs arrive? If so it must have been one mighty blast and it was the only surviving member. An alternative explanation might have been that it rolled to this spot or was pushed along by an underlying flow - but even this explanation does not have much evidence behind it. Nevertheless, this is a most interesting bomb. Returning to our car we went back to R1 (there is a little triangle of a road there that let's you join up a bit further - you'll see it) and continued. At 12.8 is the junction with R7. We went to the left and entered a sandy area. 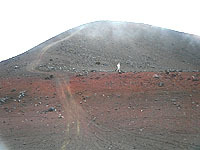 At 13.2 is an ashy hill to the right and the location of the Mauna Kea Bike Races that are held periodically. You will see a lot of activity of the hill being used as a track with many bike trails all over the cone. The road between 13.2 and 13.8 takes you down quite a ways and back into the tree line. The vegetation returns to a grass and you should again see and hear birds. 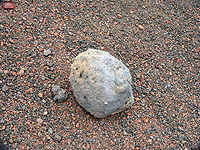 By 14.0 odometer you are down to 8,800 feet with brush but this does not last long as by 14.4 you are back out of the vegetation and into a nasty a'a lava field. At odometer 15.0 the road becomes twisty, narrow, and steep as you go through a'a ravines. Here is where the day started to turn on us. 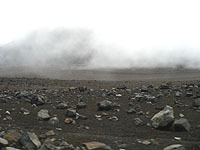 Up to this point we had been dry, with drifty clouds partially obscuring our view, but nothing threatening. However, at this point it began to rain - and it rained for the entire rest of the trip. 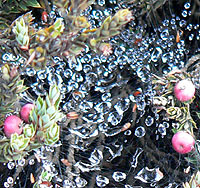 At points the rain was a deluge, but for the most part it was just a steady rain. Now, we should point out that it is very dangerous to be on this road when it rains. While most of the road is ok... sections that we have already passed through, as well as sections we are about to go through, have stream beds and flood channels we must cross. If it is raining hard above us on the summit than some of these channels may be flooded. However, as we were between the Wailuku feeds and the backside of Waimea, we had little choice but to go on and be cautious. 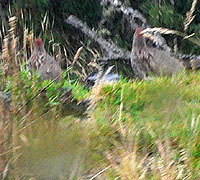 We began to see more birds, including a red tailed pheasant, near odometer 16.3 and by 16.7 we were back to a combination of brush and a'a lava flow. At 17.0 is another fork, go right. From 17.4 through 18.1 you pass through a series of sand dunes. 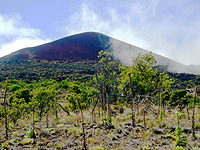 Sand dunes are very rare on the Big Island. 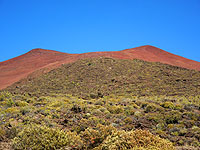 While the Big Island has just about every ecosystem, one it does not have is Sahara type desert and desert sand dunes. 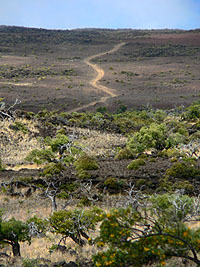 While there are small patches of dunes in other portions of the island, such as scattered portions of Ka'u, this particular stretch, from 17.0 through 19.3 is the largest section of dunes. All of the dunes in this stretch are black sand and quite a few of them are to your left, up higher on the slopes. You will, however, find yourself driving through some of the lower dunes - be careful driving here so that you don't sink down into the fine particles. At 18.1 you will see a right hand turn that dead ends within a few yards at a wooden gate. This is our next stopping point and is also a great place to have a snack and do a little exploring. Take the right and pull up near the gate. You will quickly see that this is a little triangle off the main road. At this point, looking up summit you will see more of the sand dunes we were just discussing. Beyond the gate is a meadow and to the right, a very large, well vegetated cone. While we have explored beyond the gate, there is actually much to see and do without having to climb over the gate. If you walk to the right of the gate you will find a crude path. Take the path along the fence line and you will discover, after a few yards that between the meadow and the huge cone is a very long and deep fissure. 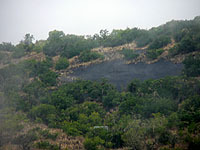 The fissure is easily 25 to 40 feet deep in spots and between 10 to 20 feet wide. It goes for a long distance, around the cone, before emptying into a valley at the other side of the meadow. The fissure is interesting and there are ways down into it, though difficult. Near the end of the fissure, by the fence, the fencing stops and there is a gentle upslope worthy of a short walk. We often pick this spot for our big break - and have more food and water while exploring the area. 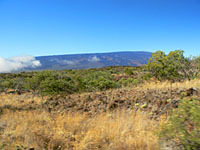 This is about the half-way mark and we are now beginning to go around the backside, or Waimea facing side, of Mauna Kea. Back in the car, we rejoin to the main road and discover more dunes up to 19.3. At 19.8 the road becomes seriously 4-wheel only. We highly recommend getting out here and examining each fork in the road to determine which is better. Both take you to the same spot, which is quite a bit down the road and around a curve. We went to the right and it was very tough going -- very rough road and very rocky. Everyone, of course, followed us and at one point there had to be some backing up and going forward again as people got stuck in hard spots. We suspect, but didn't confirm, that going left at the fork might have been a bit smoother. Now at this point it is starting to rain pretty hard - visibility is very low - only about 20 feet. However, past rides on this road remind us that there are spectacular views to be had on a clear day, both upslope and downslope. The Waimea side of Mauna Kea looks down a huge steep slope to a valley, then back up a bit to the town of Waimea, very visible in the distance. 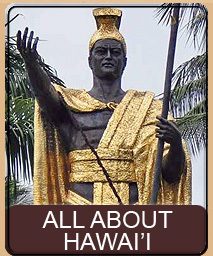 On good days Maui might be visible and you can also see good views of the ocean. However, for us, it is only rain and more rain. At 20.2 the road becomes ok again, but at 20.4 you go up another very steep hill but by 20.7 again the road is fine. We should also point out that through much of this area we encountered many birds - most of them ground-birds who were enjoying the road. 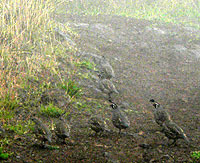 Since the weather was so poor we were able to obtain only a few photographs and could not easily identify the bird types (pheasants and grouses or something similar). As you go through here, another feature you will begin to see are steep flood channels to your left that go over the road and continue down the side of Mauna Kea. These are very dangerous in flooding situations - though luckily for us there had't been enough rain yet and these were only flowing a mere trickle. Also be careful of the right side of the road as some of these flood channels have washed out a bit of the road. At 22.7 is R9 to the right - go straight here (not right) following R1. By 25.8 you will be on a much better road that will open up into different meadows. 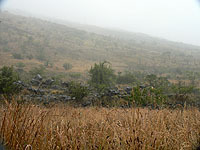 At 26.7 is some fencing, a pasture, some quite large rocks and if you look carefully, a hunters cabin hidden in the trees. You can get a better view of the cabin a little further down the road after the road takes a curve to the right. You will continue through meadows (with beautiful views when it is nice weather) till the 31.7 odometer and the R10 junction, continue on R1 and the road goes from rocky to a regular dirt road. At 32.5 you enter a forest grove and after a short distance you will come out with a cabin on your left and the road will end at a closed gate. The cabin is another hunters cabin - available to hunters to use during extended trips. Pull up to the gate and get out and open it (it should not be locked - if it is locked, I hope you brought your bolt cutters :~). We have had only one report of the gate being locked - and we have never encountered it locked ourselves (nor have numerous friends who have taken the road). Drive through the gate and be sure to close it securely behind you. Follow the dirt road. I'll also mention that at this point I accidentally turned off my GPS, forgetting that it was still a bit to Saddle Road. I turned it back on after a small distance, but if you are following the GPS coordinates you will notice a gap in the track. Don't fret, the road is easy to follow at this point and you won't get lost. 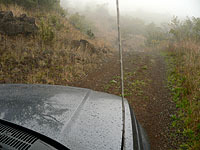 As you go down the dirt road you will encounter side roads, most of them with R-signs. 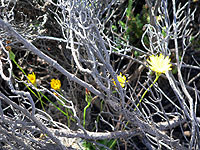 These are mostly fire-breaks and there is little to see, though some are hunting roads. At 34.9 is a junction with R15. 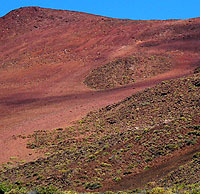 To your left you will also see a pretty impressive cinder cone. There is a road to the top of this cone but we were pretty tired and didn't want to go all the way to the top. However, we did turn onto R15 and drove to the base of the cone. It is a short distance to the base and you will find that there is a motorcycle track here - so this is probably a pretty popular weekend spot, though it was empty today. Going out R15 the way we came in, we rejoined R1. At odometer 37.0 you encounter the Kilohana Hunters Station - a small shelter, and the road ends at Saddle Road. Whew - the trip is done. It was unfortunate that we had rain halfway through, since on a clear day we would have had twice the number of photographs... but it was still well worth it and everyone made it out ok. 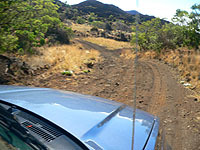 The end of this scenic drive deposits you onto Saddle Road at the Kilohana Hunters Station near the Girl Scout Camp Headquarters, and makai (ocean side) of Bradshaw Military Base. If you are heading to Kona make a right onto Saddle Road. If you are heading to Hilo make a left on Saddle Road. This page is named 'Drives.ur'. Can't Find It?